When last I left off, I'd just been granted access to the remains of the destroyed Dream Machine in Olympus. But Legrande had demonstrated a certain degree of trepidation about the matter - it was off-limits by Segal's order, after all. I'd have to make sure I got the most out of whatever time I was able to get with the machine, and in order to ensure that, I thought it best to find out everything I could about the Machines before examining the destroyed one in Olympus. Knowledge was power, and it suited me to arm myself well before venturing too far forward. To that end, I decided to head for Hellas. Word on the street (er, so to speak) was that a man there knew a good deal about the Machines. What sort of state this had left him in seemed to vary depending on who I talked to, but it seemed that the man was my best lead for getting a decent sense of what I might be getting into with the Machines. Fortunately it was a very quick trip to the settlement. With the power on the planet restored, the transport tubes just outside Olympus were active once more, and after some fiddling about figuring out which tube led where by means of coordinates I'd been previously given, I found myself standing on the outskirts of Hellas itself. I really want to know what a Martian orchestra sounded like. Hellas stood in rather stark contrast to the bustling Olympus that I had just left. Whereas Olympus had been a Martian settlement now taken over and made suitable for a sizeable human population, Hellas - a hub of sorts for the canal system, it looked like - seemed to be mostly abanadoned and untouched by human hands. There were remnants of the Martian population everywhere. Musical instruments that still wheezed when anyone attempted to make use of them. Gardening tools were stored near a greenhouse. A room where the Martians could kick off their footbags (what I surmised passed for shoes among their kind) and soak their... roots? Feet? What *do* you call the extremities of sentient plants? Wherever I turned, there were new facets of Martian culture to take in. 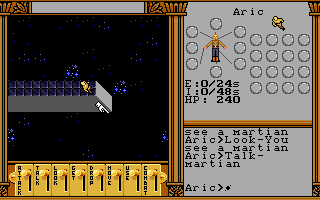 Jewelery, money, scrolls and writing implements - here was the best sense I could yet get of what Martian day to day life had been like. Yet it took brought up new questions. What had happened? Why had the settlement apparently been abandoned? It did not seem like answers were going to be swiftly forthcoming. In my explorations of the city, I came across a Dream Machine, which I left alone until I had a chance to find and talk with Marcus. I eventually found him in the greenhouse, and he seemed very glad for the company. Indeed, he was the only resident of the empty colony, and he was evidently starved for human interaction. 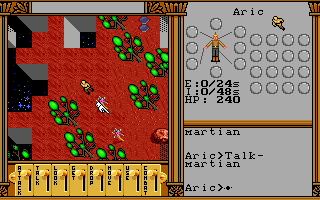 Emphasis on human - according to Marcus, there were berries in the gardens that allowed him to talk with some of the Martian machines, though he could not fetch them very easily due to the fact the gardens were overrun with jumping beans. He had much to tell us of the Machines - the long and short of it were that they pulled you into a dream world ruled by imagination. There was a substance there, dreamstuff Marcus called it, that could be shaped by force of will into whatever could be imagined. He claimed to have seen Lowell and others in the Dream World as well - he theorized that the Elysium crew had been trapped in nightmares while Martians already in the Dream World took over their bodies. A chilling prospect indeed, if true - but it made sense, based on what we had heard. According to Marcus, visiting the Dream World left your body vulnerable, and if someone made it back to it before you did... well, possession didn't seem like such a far-fetched idea in light of that. 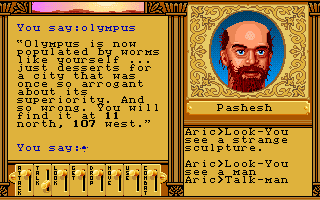 He informed us that the machine there in Hellas wasn't working, but perhaps we could ask it what it needed, using the berries he'd mentioned earlier. So it was off to the gardens to do some weed-pulling (in the form of culling jumping beans) and berry collecting. Along the way, we passed a building we could not enter due to a rusted door. Upon using a flask of oil we had on hand, we managed to work our way inside and were rewarded with what appeared to be live Martian seeds, as opposed to the dead ones we'd seen in the power plant. This seemed like a valuable find indeed, and we took them with us. I love how different the "machine" dialogue feels compared to the rest. It took some experimenting, but eventually we found the green berries allowed us a certain sensitivity to the Martian machinery. 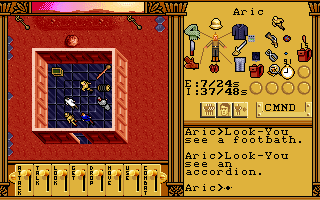 It wasn't communication, exactly, but even so, after partaking of the berry, Aric was able to read certain sensations that came from the Dream Machine. It felt... blocked, somehow, dead, even. A vision of a glowing rock came to mind, and we quickly installed the block of radium that we had found in the Olympus mines (using all due precautions, of course). This restored power, but the machine gave off a sense of a missing connection and a lack of direction. Direction was easy to provide, we simply installed the repaired control panel Edison had given us. A missing connection, however... that suggested further missing parts. Perhaps the remains of the machine in Olympus would prove useful after all. With a machine in Hellas freely accessible, it felt less important to be cautious about spending our time with the machine in Olympus so judiciously. So we headed back to examine the wreckage, and sure enough, found a part that the Hellas machine appeared to be lacking, a headset of some sort. Maybe that would provide the connection the Hellas machine was missing. Yet there was one other thing we felt we had to do before returning to it. We had gone to Hellas in the first place in search of information, and we had found some. There were still questions, though, and suspicions that demanded investigation. There was one place we might be able to find some answers to them, a place we had been warned about several time already. It was time to head to Elysium. ...talk about the fern calling the shrub green. Hellas had stood in stark contrast to Olympus due to its emptiness, its sense of abandonment, its lack of residents. Upon reaching Elysium, it quickly became evident that it too stood in stark contrast to Olympus, not due to the quantity of its denizens, but the quality. The people we found in Elysium were ragged, rumpled, as if they weren't taking care of themselves properly. And it soon became clear as to the reasoning why - Marcus' suspicions about the Elysium expedition proved to be entirely on point. Speaking with them, they always gave two names upon introducing themselves - a Martian name first, the name of the body they inhabited second. They were, in fact, Martians that had taken advantage of the workings of the Dream World to inhabit the hapless crew that had scouted out the settlement in the first place. Though rattled by this discovery, we did learn a lot. The Martians of Elysium were often dismissive, elitist, and haughty, derisive even, of "worms," as they called us, but even so, we learned a fair amount of the workings of their society. Fazek and Chesef spoke at length on the process of growing a new Martian, though they didn't know the mixture of the fertilizer used. They did mention that their chemicals often came from Hellas' Gatherer Pukchep, and their Cultivator had a chemical lab. We'd already explored it, but it was heartening to know we likely already had what we might need on hand. Xichak told us of his search for water, and suspected that the icecaps may be the best solution. But it was Tekapesh, Bikchiz, and Chaktsaf that gave us the clearest picture of what exactly had happened here in Elysium, and indeed Mars as a whole. Each of the three of them gave us different pieces of the story, but the long and short of it was that Raxachk, leader of the settlement at Argyre, essentially wished to bring the entire planet under his control. When the other leaders failed to cooperate, he released a plague into the air which ravaged the population. The only survivors were those who had fled into the Dream World to escape it, and those in Elysium had taken the chance presented to them when Lowell and his entourage had arrived. They had stolen the bodies of our Earthling compatriots, using their plague-immune bodies to find a way to grow "proper" Martian bodies once again. 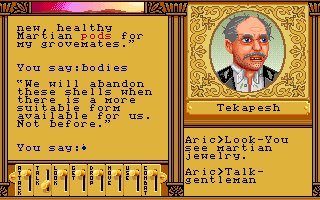 Tekapesh refused to abandon the bodies to their proper owners until they had a way to get more "suitable" ones, as he put it. Though Pashesh, Bikchiz's assistant, claimed that Elysium was the most advanced of the groves, it seemed they had thus far been unable to recreate their growth process. I must admit I wondered at the accuracy of Pashesh's statement as a result. From what they told me, I had a general sense of what would be needed to grow a new Martian body, but I was still lacking the proper mixture for the fertilizer used. I resolved to follow up on this thread later, and returned to Hellas in order to venture into the Dream World for myself. I don't think we're in Kansas anymore. It was a fairly quick trip via pneumatic tube back to Hellas, and after several deep breaths and steeling himself for what was to come, Aric took a seat in the Dream Machine, Spector threw the switch, and slowly but surely his consciousness faded from the physical to the metaphysical. In the Dream World, five obelisks stood tall, each engraved with a different image - a sickle, a lamp, tracks, a Martian. Approaching the first of them led to an oddly lush landscape, in which the trees moved and often obstructed the way along a narrow path. Weaving through them led to none other than George Washington Carver, who wanted help with an experiment - he needed to ensure a plant grew to full maturity, and wanted assistance repelling the oncoming worms. It took some doing, but careful use of seeds which sprouted plants that kept the worms away long enough for me to kill them eventually allowed the pod to grow, and slicing it open revealed none other than Carver himself. Content that he had now experienced the full Martian life cycle, he was released from his nightmare. The second obelisk led to a long, twisting passageway, businessman enjoying themselves and laborers hard at work visible just off of it. This, then, was likely Lenin's dream, and sure enough, at the end of the passageway the man himself was present, along with money littering the floor. He demanded assistance in distributing the present wealth equally, so after gathering all the money and separating it out into 25 equal piles (and relinquishing the extra 3 rubles and an azurite stone "to the state" for "the benefit of the masses"), Lenin was satisfied and he too was released from his nightmare. Two obelisks explored, three more to go. The third was full of dreamstuff, and was very disorienting to walk through - every so often my controls would flip around, so it was rather difficult to discern which way was up sometimes! Using the dreamstuff led to a large variety of materials - a broken robot, an adding machine, various weaponry. These proved to be useful once Aric finally found his way out of the passageways to a distraught H. G. Wells, surrounded by invisible creatures! Figuring out where they were was simply a matter of examining which directions the footprints in the dirt were heading, and after dispatching the invisible beasts, Wells too was freed from his nightmare. Tiffany's dream was an odd beast, as Aric found himself attacked by his own mother, and in the process of fleeing for his safety ended up falling off a very large cliff! The fall apparently did no lasting damage, however, and exploring his new surroundings (interrupted every so often by crashing noises and shaking) revealed a book on bullfighting, of all things. I was rather amused by the fact bullfighting, according to the book, worked on three principles. The Courage to master your fear, The Love that was compassion for the bull and the audience, and the Truth that the bull was easily distracted and could be led by waving a red item. There was even opportunity to put these three principles into practice, as the crashing noises proved to be a literal bull in a china shop, complete with a very frazzled Tiffany. Luring the bull into a side passage by waving around a red throw rug proved enough to save the fragile merchandise, and thus saw Tiffany freed from his own nightmare as well. Dream-Hellas seems like it's falling apart a little. The fifth obelisk, however, was not the dream of an Earthling. Instead, it was the dream of the remnants of the Hellas grove. Hellas was not, it turned out, the empty and abandoned settlement it had appeared to be. They had only moved into the Dream World, a version of the grove that was hazy and fragmented as the realm it resided in. 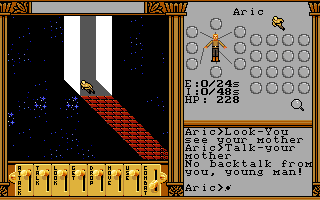 In fact, I found myself reminded of the Gargoyle Lands of Ultima VI, replete with various portions of it falling away into starry void. Conversing with the residents told much the same story as that I found in Elysium. The main difference was that the Martians of Hellas were much more congenial and friendly, and wished to work alongside the humans of Earth in finding a solution to the problem of the plague, instead of merely using them as the grove of Elysium did. Prektesh in particular, leader of the Elysium grove, condemned the "theft," as he called it, though there was little he could do about it from the Dream World. He did say that they would surely keep their word about exchanging the bodies of our compatriots for aid, though - it seemed growing a new Martian would prove necessary after all. Plashef helpfully expounded upon the missing pieces of that particular puzzle - how to tend the seed, and the proper blend of nitrogen, phosphorus, and potassium needed to nourish it. Xaktsesh also informed us of a second plan her podmate had formed. He had a laboratory in the polar regions, hoping that the cold would slow the progress of the plague while he worked toward finding a new type of body immune to the plague. 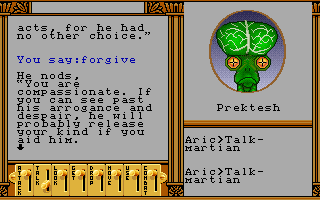 Perhaps if a new Martian could not be grown, this would be worth investigating, but I needed to free the Earthlings in Elysium. I would need to follow Tekapesh's plan for now. It was time to grow a Martian. note the grey rather than gold background. That was where I ended the session, and it struck me just how varied a session it was. I absolutely loved the dream sequences, all of them stretching the engine and mechanics to their limits to accomplish a large breadth of things. Equipping the throw rug to distract the bull, dealing with the mixed up controls, figuring out how to properly use the items I'd been given, there were so many different things going on in the dreams and each of them felt unique. 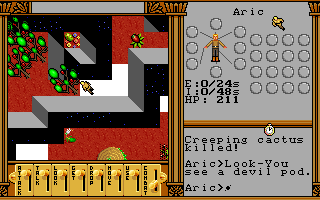 It felt like it really stepped up the interactivity from Ultima VI, what with the large variety of things I could use and mess around with (some of the stuff I got from dreamstuff in Wells' dream was enjoyable to play with, even if it proved utterly useless), but did so in a more approachable manner than Savage Empire, which felt like it overcomplicated the process a bit, especially with the rifles and bombs one could make in that game. Then too do I find the aesthetic of this game much more appealing than Savage Empire, and not just because the genre as a whole clicks better with me. Though it's a very different take for the series, there's a lot of elements that put me in mind of the main series, much more so than Savage Empire did. I already mentioned the parellel between dream-Hellas and the Gargoyle lands as far as aesthetic went, but the story of Hellas also put me in mind of Magincia: a beautiful and renowned settlement fallen to decay and abandonment, chatting with the spectral remnants of its population to figure out what happened to it and why it fell. 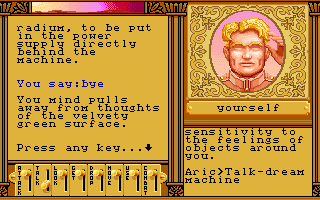 I could even make the argument that Martain Dreams' story is essentially just a steampunk reimagining of Ultima VI's story - but I think I'll save that for my closing post, that's where I generally do my dissecting of Overarching Story in the first place. So on that perhaps tantalizing note, back into the game I go to find out just how green my thumb is - I suppose it's a good thing my mom had me spend a lot of time helping out in the garden growing up, huh?